First Church of Christ, Scientist in Green Valley | Welcome to our healing church! Christian Science practitioner instantly healed me of migraine headaches. Christian Science healed my extreme leg pain and disfunction. Christian Science healed my painful feet. Christian Science healed me of TB, tuberculosis. This testimony is about a week-long ‘marathon’ upon the passing of my mother, and several experiences of the power of enduring Truth along the way. To say that I never could have done this without Christian Science is an understatement. My mother, a resident in an assisted living facility in southern California, passed away the week before Christmas some years ago. Both of my siblings — my brother, who resided in Mexico, and my sister from Vancouver Canada, — were there. I came from Portland OR, and soon a close cousin from Colorado flew in. In addition to the sadness we all felt, we knew we had to deal with legalities and find satisfactory places for all of Mom’s belongings, including the contents of a storage unit, before returning to our respective homes. It was all very overwhelming. At home, my husband and I had an exchange student and had planned a ski vacation to northern Idaho with two of our daughters and their families. We were scheduled to pack up and drive there before Christmas. I called a practitioner, who reminded me that divine Love could never depart, and was present in every circumstance, always. This was unchangeable, no matter what appeared in the material picture, and was true for all involved. Peaceful relief flooded over me, and I kept this fact close to my heart. We gathered together the next morning to review and regroup. We affirmed that we loved Mom and each other, but acknowledged that we each had different needs and abilities. We agreed to respect those differences and not put any personal ‘expectations’ on each other. We understood that this respect was a way of showing love, and we would keep this in mind as we did the work in front of us. We knew this work was also for the love of our mom, who had shown us so much love throughout her life. Gestures of love poured in daily. Employees in the residence came up to us and told us dear stories of mom, who had shown an interest in them and their families. They offered to help however they could. We put the word out to other residents about furniture and were quickly able to locate those who could use bed, sofa, tables and chairs. We found someone in the business of selling art. Legalities sorted themselves out promptly and easily. We had time to go to a favorite beach of Mom’s and share cherished memories. One evening, seven of us (including a small dog!) piled into Mom’s car and went to dinner at her favorite restaurant. It was a small and somewhat elegant place with subdued lighting. In an attempt to be able to read his menu better, one of our party got too close to a candle flame and accidentally lit his menu on fire! No one was hurt and no damage done. Everything was put right in short order. We howled with laughter, knowing that Mom with her wonderful sense of humor would have loved it. In the ensuing days, my sister and cousin were able to get back to their jobs in a timely fashion. There were just a few details left to handle, which my brother and I were able to stay on to take care of. Meanwhile, in the days before Christmas, unusual arctic blizzards had hit Portland. Although the airport had been shut down for days, I had to show up at LA airport to wait for the notice that my flight was cancelled. Then I had to get back to Santa Barbara and find a way to go home. It quickly became clear that all transportation — flights, trains, and even busses — was booked. The very last detail was Mom’s car. Since we weren’t able to locate title or insurance papers, we had decided to leave it in Santa Barbara until we could see what to do. Well, harmonious divine Love was ever active. We realized that I could drive it back to Portland. The next day my brother made multiple trips to the DMV to get things in order. I called a practitioner for support and left Santa Barbara at noon. Several problems arose during the trip. Mortal mind was shouting that conditions were difficult, if not impossible, and that God was not in charge. I prayed frequently and was so grateful that the ‘peace which surpasses understanding’ overcame upset with calm. Problem: It became apparent that the windshield wipers were bad, and I knew I would need chains on snowy roads further north. Quickly resolved: I called my daughter with my location, who then went online and found a car dealership and auto supply shop at the very next exit. She continued to be an invaluable, cheery help all along the way. Problem: Food, equipment and supplies needed to be packed for our now delayed ski trip to Idaho. Quickly resolved: I called the exchange student with lists and directions, who willingly and efficiently did the packing. I arrived at midnight at a snow-covered town in northern California, found a motel, and was on the road again by 8 am the following morning. Problem: Chains were required to get onto the freeway. Quickly resolved: A guy right there at the freeway entrance ready to put them on. Happily paid him to do that. Problem: One of the chains immediately broke and flew off. Quickly resolved: With no one else on the freeway, I was able to walk back to pick it up, enjoying the quiet winter wonderland. Was able to continue safely with the one chain until I arrived at the next town, in Oregon. Problem: Got lost in town finding a place to deal with chains. Quickly resolved: My daughter lovingly directed me via internet and phone to the tire place. Problem: The tires on the car weren’t made for chains — news to me that there was such a thing! Quickly resolved: Tire shop had the right studded tires and was able to put them on promptly, although the place was packed with motorists dealing with the challenging weather conditions. Problem: There was no room in the small car for 4 other tires. Quickly resolved: Although the tire shop wouldn’t take them and told me I couldn’t leave them, the fellow who put on the new tires agreed to take them and could benefit from any value. I continued on my way, checking in as needed with a practitioner and praying in whatever way came to mind. Due to the snowy, icy roads, progress was relatively slow. Nearing Portland, road conditions were the worst I’d ever seen. Due to the frozen rutty roads, it took an hour to go every 10 miles. I arrived home by 9 pm. Unpacked, re-packed and was ready to go at 7 am the following morning, which was Christmas day. I experienced no fatigue and felt completely calm and peaceful. We made the trip and had a wonderful Christmas, albeit the day after actual Christmas day, and greatly enjoyed our time together. I am so grateful for the loving prayers of practitioners and for Christian Science, which Mary Baker Eddy was so dedicated to bringing to the world. Divine Love does indeed meet all of our needs. What wonderful reassurance that the laws of God are continually in place and are supreme over every material condition. 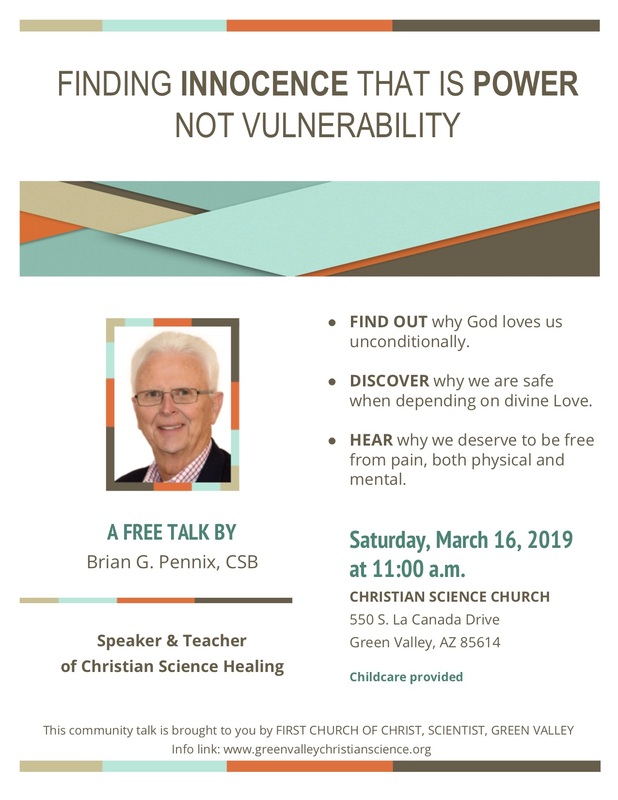 Join us for a Christian Science lecture: “Finding Innocence That is Power, Not Vulnerability”, by Brian Pennix, C.S.B. the telephone access to our services. God works in mysterious ways is the saying. Today I found that to be true. Well, research along with asking a church member did not result in the answer. message I was searching for. with you of God’s love, care and direction. 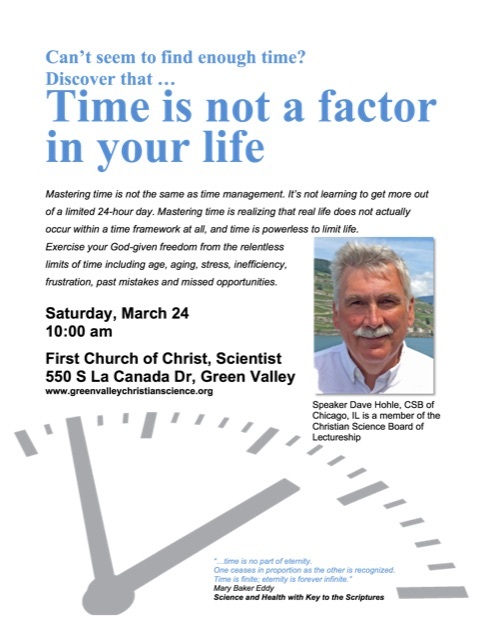 As I was not in town Saturday I missed the talk “Time is not a Factor” by David Hohle so I listened to it on the internet. I was astounded to be reminded of an experience I had several years ago that appeared like a miracle to many people who knew the story. At that time my daughter Karen and family lived in Whitestone NY. She is a flight attendant for a major airline which entitles her parents to fly space available – no ticket required. When I plan to visit them, we coordinate my schedule with hers so she is home and not working. As there was no direct flight from Tucson to NY, I usually would change planes in Dallas. I never had difficulty with this practice until one particular visit. That summer, huge storms came up in Texas and many flights were severely delayed to and from the DFW airport. When I arrived, the terminal was teeming with stranded passengers and I found I was number 68 on the standby waiting list for NY. Most all of the others were paying standby passengers with priority. It looked impossible. Then my daughter flew in – she was actually supposed to be in NY already but her flight was delayed also. Her working flight was cancelled to NY so she too was standing by but jump seat qualified so not a problem. She vowed, however, to stay overnight with me if necessary and it did look inevitable as the list of people ahead of me was growing by the minute. I knew down to my toes that it was correct for us to be in NY that night – many things were planned for the visit and it was a short window. I gave it to God. The feeling of strong assurance came to me that we were in a river of love running through it all in spite of how it looked humanly. I pictured us moving forward in this river and at our destination as planned because God was the doer here. I felt serene and confident. I passed this on to Karen and asked her to visualize our moving on to NY. She got it and she did. At one point we walked up to the front desk to see what the list was doing. It was bigger. Just then, Karen overheard the desk clerk telling someone that another flight, also scheduled hours earlier and delayed, was set to leave in a few minutes. Karen’s ears perked up and she asked how many standbys were on the list for that plane as usually when one flight leaves, all the listed people are rolled over to the next one and that had not happened yet. The clerk said none and there were two empty seats. She quickly rolled our names over to it on the computer and said “run.” — We ran and were awarded the last two seats on that plane just as they were closing the doors. We reached NY in time for a yummy dinner her husband had prepared for us. In February, 2013 I was in Pennsylvania at my daughter’s house in the Pocono mountains waiting for the “emergence” of my grandson Dylan. Her mother-in-law was also present – we were having fun with our other little grandchild Alina. The evening my daughter and hubby were in the hospital in Scranton, I excused myself to retire early to my room as a sharp pain in my chest seemed to be developing. I declared Truth as learned in Christian Science since childhood and was calm and unafraid. The strong message came not to let anyone catch wind of this – just keep working in the Christian Science way. The pain increased to the point it was difficult to breathe. I had a practitioner in our church in my phone on speed dial and called her. I could not speak much but conveyed who I was and the error that was presenting. She lovingly helped me right in the moment with positivity and strong assurance all was well. Total relief, relaxation and peace pushed away any concerns. I sat up in bed all night feeling loved and grateful, secure in God’s great love. Breathing became easier right away and by morning there were no remnants of this experience. I was healed in full. That day, mother-in-law and I tugged two big garbage cans through the snow to the roadside and no one was the wiser! That day was filled with beauty, gratitude, love and joy in the arrival of Dylan. There has been no return of these symptoms and I remain immensely grateful for Christian Science and our loving practitioners. There was and is no need to determine what the belief was. Christian Science heals regardless in Jesus’ way. I am also grateful for our wonderful hymns. The words, “Everlasting arms of Love are beneath, around, above” from Hymn 53 were not only in my thought at this time but felt so deeply I knew all was well no matter what seemed to be the suggestion fighting for life. Thanks to the practice of Christian Science healing, human chaos was totally avoided. One can only imagine the turmoil that would have resulted otherwise! Love is the liberator. One of my daughters and her husband, who is Puerto Rican, had an all white pleasure boat named “Baby” moored at a marina in Fajardo, Puerto Rico. They live in Pennsylvania. When hurricane Maria approached at category 4 or 5 strength it looked like Baby was at great risk. Indeed, the marina was destroyed and most of the boats there sank or were destroyed. 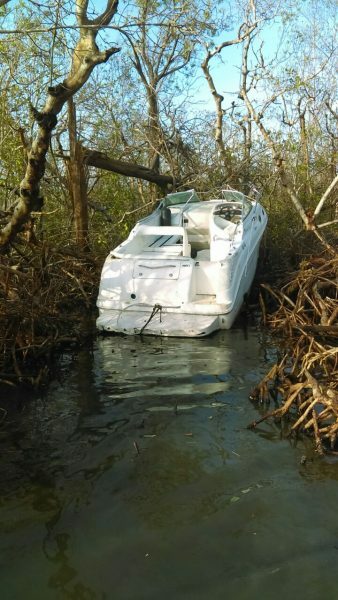 However, a family friend in Puerto Rico went searching for Baby by boat as my son-in-law had the feeling she was ok. The friend found her about a mile and a half away resting in a big pile of debris above the high water line. Baby was unharmed with no punctures to the hull. The inside living quarters and engine compartment were dry. It was remarked by others that she looked like a bird resting in her nest. This reminded me of the song “White Bird” made popular by a group in the 60’s – “she must fly or she will die”. She is now known as “Baby White Bird”. She is flying! A successful group effort to extract her is under way and she will be stored safely on land until brought up to Pennsylvania. Our family members on the island are also safe. While praying for our resident Puerto Rican family, I realized I could not just outright dismiss and write off Baby. She was not in Truth a material object. This boat represented much life, love and joy to my daughter and son-in-law and was a part of them. Both were raised near the ocean – my daughter in Hawaii – and the ocean is dear to them both. I mentally wrapped Baby in the light of God’s love, thinking of her only in spiritual terms and keeping her safe in a crucible of light and love. Praying in this way each time the situation came to my thought until I felt at peace, I was able to maintain the idea of the boat as a spiritual representation of joyous living and loving qualities untouched by and floating above the seeming chaos. I had a night dream years ago that I was about to be inundated by a huge tidal wave. In the dream I realized the wave was not real as it was coming from the land and the ocean was behind me. I turned my back on it and shouted to others on the beach that it was ok – the wave was not real. They did not listen and were swept away when it parted around me and kept going. I am still learning from this angel message. To me, this illustrates Baby’s protection. 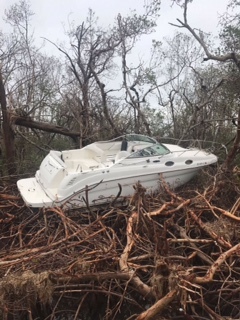 The hurricane was not harmful as the idea of this particular boat was being held in Truth. I am so very grateful for Christian Science, our lovely church, Christ Jesus, Mary Baker Eddy and so much more! One day I was going to my softball practice. We were working on pop flies. I reached out to get it and it hit my finger in mid air and bent it backwards. It really hurt and I couldn’t move it at all. When my mom came to pick me up after class I told her what had happened and she said some comforting things. When we got home I called my practitioner and he said some very comforting things. Weeks went by of praying. After a few weeks I couldn’t even feel the slightest bit of pain and I was very grateful. I go to the Christian Science Sunday School. Judy: Tell me about your healing by a Christian Science practitioner of migraine headaches and the spiritual sense of well-being and peace that this spiritual healing left you with. Jan: Oh, yes, that was just the dearest experience. It took place in Milwaukee, Wisconsin. The practitioner lived in a hotel, she had a suite. Her sister also lived in that hotel. They had a beautiful view of the lake, and she was very active. I had been having migraine headaches for 35 years. The last one that I had, I was so ill that I just really felt that I wasn’t going to be able to manage another one. There’s that word “I” again, me, me, me, me! I hadn’t had any Practitioner working for me, [providing healing treatment] because this was something that just came up at unexpected times. [When it did] I would study and fill my thought with good and then I’d be okay, and then [there would be] a next time. So I decided that I was going to let God do it [heal me]. I called her a year later on something else. Her sister answered the phone and said she had passed on. She had been sitting in a chair, doing careful meditating for someone. Her sister said, you know, she was 91 years old. [Yet, when I saw her year earlier] she looked like she was maybe in her thirties. It’s kind of hard to judge ages when someone is that alive. She wasn’t what you’d call vivacious; she was just, uh, it was indescribable. Judy: You mentioned the Practitioner “meditating.” Can you share with me what the word “meditating” means to you? Jan: It was so effortless with her. I felt like she had gotten herself out of the picture. She just went directly to God. There is no sense of person there. The outcome of my being healed was that I suddenly realized, oh my gosh, I haven’t had a migraine or a headache of any kind this last year, and I haven’t since! I just left it with her and it wasn’t part of me anymore. It took a year to recognize that I wasn’t having the kind of spells I’d been having, or believed I was having. That was a beautiful, beautiful experience. And I think it’s the thing that keeps me grounded now, so to speak. I was flailing around a bit after Bert left (passed on). There were times that I even wondered if I should bother going to church. Judy: You know Mary Baker Eddy put in our Church Manual, p. 42, “Prayer in Church, Sect 5. The prayers in Christian Science churches shall be offered for the congregations collectively and exclusively.” That tells me that Mrs. Eddy knew that Christian Scientists have a challenging road to travel and we need each other’s loving support along the way. And we need to come together at church to “collectively and exclusively” support, comfort, and express love for and to each other. Each student of Christian Science is an indispensable component in realizing our calling and fulfilling our duty as a true Church of Healers. Judy: That is a wonderful testimony to the healing Spirit and the living Principle of Life, Truth and Love, ridding you of all fear so you were able to hold to God’s truth of the perfection of your child, His child. Jan: Well, I had the advantage of being an at-home mom at that time. I’m not saying that’s why but at least I had the opportunity to meet this condition through what I believe. Because I really believe that God is the greatest power. And my husband, a Christian Scientist, left it to me [to work through and meet the error for our child]. He had complete confidence in God and me.